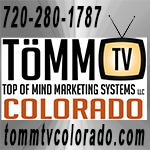 Local, Online Marketing - Advertise with My Mountain Town! Wondering how to improve your local digital marketing? We can help! We all know social media is here to stay, but it feels like swimming upstream to build audiences and reach them effectively, doesn't it? Which is the best platform for you to use? Facebook? Instagram? SnapChat? Pinterest? Twitter? It can depend on your industry and your target audience, but mostly on what you are comfortable using. What most don't realize is that social media platforms aren't just tools to use when needed, it's all about relationship building. And that takes the one thing we have the least of: time. Facebook keeps changing its News Feed algorithm and decreasing the reach of Business Pages to their own fans. Sharing business info/sales/news to local Facebook Groups is helpful, but many groups have rules against posting ads or limiting it to one day a week (FYI, we welcome business posts anytime!). If you scroll back through most groups' posts you'll see that many business posts have very few Likes or Engagement - members of the groups avoid those days that businesses are allowed to post and recognize serial business posters in their notifications so they can easily avoid clicking to see what they posted. A group may have 10,000+ people in it, but in no way does that mean that all 10,000 see it. Whatever number of people there are in a Closed group means that is the maximum # of people who *could* ever see your post; same goes for NextDoor which is locked down by neighborhood. Reach is very limited, especially because Closed Facebook groups and posts on NextDoor are NOT indexed by Google and will never show up for someone who is searching for something in Google (or Bing) that would help them find your business or nonprofit organization. If you truly want to reach a larger, local audience, you should be posting on MyMountainTown.com! We are completely open to the public, the most recent posts are all fed chronologically to our Home Page - no hiding certain ones ever, our posts are organized into separate Forums based on subjects (so no politics when you all you want are the Business Classifieds!) making them easy to search. 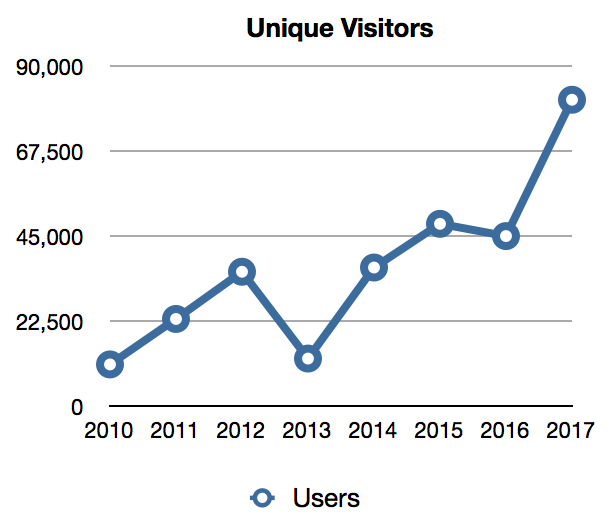 Last year we had over 80,000 unique visitors to our website, and reached hundreds of thousands more through our social media accounts on Facebook, Twitter, and Instagram. Posts on our website are indexed by Google and will help customers find you on Page 1 of Google search results when they need you (when is the last time you Googled your business name to see where and how you are found?). Best of all, unlike Facebook and Next Door, we shop local and support local by giving back to the community and being involved in the community. By posting on My Mountain Town, or paying to advertise on MMT, you are helping to support local too! 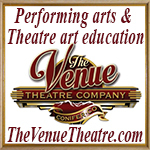 Replied by MyMountainTown on topic Local, Online Marketing - Advertise with My Mountain Town! 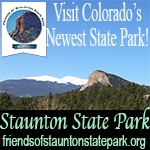 Advertise on My Mountain Town during the busy fall leaf changing season to visitors to the area and your local community alike! We've put together a package of traditional graphic ads on MyMountainTown.com combined with social media boosts through our highly active My Mountain Town Facebook Page and Twitter account to seriously increase your visibility and bring in customers! 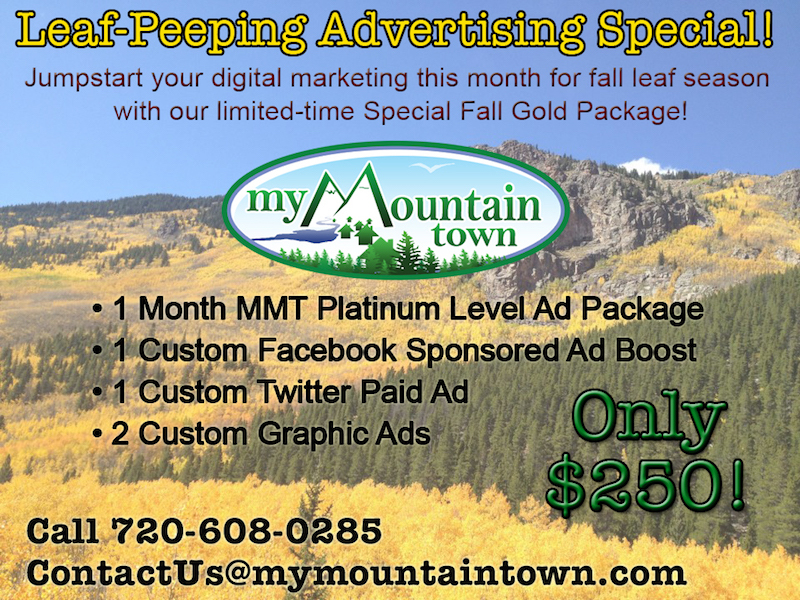 New this week, we're launching our first ever "Fall Gold" Advertising Special at My Mountain Town! September is a crazy time when thousands of people flock to the mountains to see the changing leaves and beautiful scenery. They're on their phones searching for where to go while driving so that means upping your online marketing efforts...and our website is optimized to best help with that! From being mobile-responsive and SSL secure to having the latest weather and most comprehensive traffic webcams, our site is set up to come up higher in mobile device searches. If you have a store front, restaurant, or other tourism-related business, you want to tell them on their way by why they should stop in and patronize you! 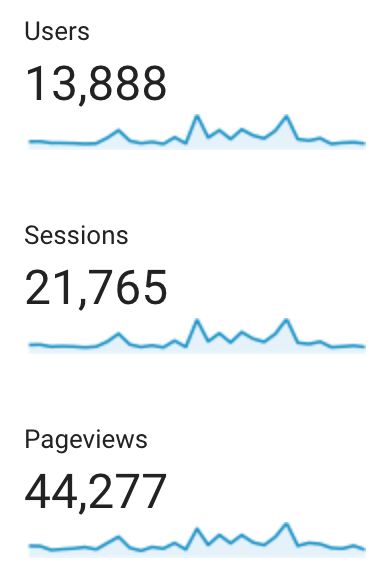 With over 13,000 unique visitors per month, and reaching tens of thousands more organically through our social media platforms (see stats below), we have a perfectly targeted audience for you to reach. In addition to a graphic ad on our Home Page that currently receives 20,000-25,000 impressions/month, we're including a custom sponsored ad through our Facebook Page with 7,600+ Fans for your business and paid ad to our 3,100 Followers on Twitter to really boost your visibility! We'll design the ads and create the campaigns to help those aspen gold hunters find you. 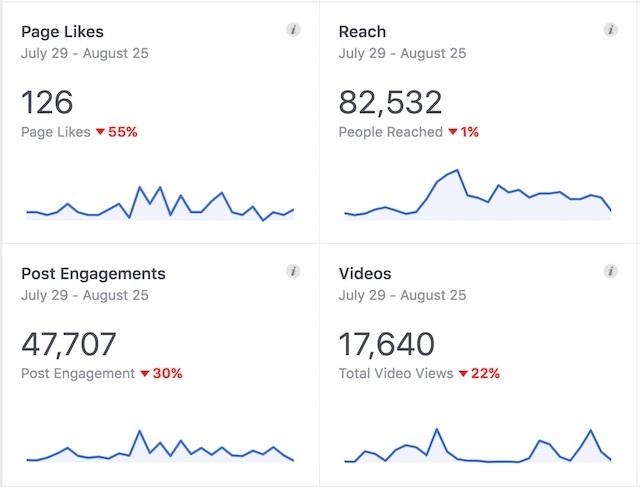 My Mountain Town Facebook Analytics, past 28 days - all organic, no paid boosting in these numbers at all so we'll reach significantly more with paid ads! My Mountain Town Twitter Analytics July 29 to Aug 25 - again, all organic, no paid boosting in these numbers at all! All that listed above for only $250! As evidenced by the stats in the article below, people are increasingly using their mobile devices to search for what they want nearby and right now. It's very important that your website has information such as the hours you are open, your address, and exactly what products or services you offer (in text especially, though pictures of your products or before/after results of your services are important too). Additionally, the more websites on which you can get that information shared, the more likely Google will show people your business website as a result of their search for what you provide. 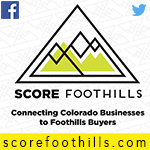 That's why joining Chambers of Commerce and My Mountain Town and posting regularly are important - those Directory listings and additional places to post news, events, special deals, etc. all help boost your business in searches! Not all websites are created equal upon which you can get your business information added though. If they aren't configured well, aren't mobile responsive, aren't SSL secure, or aren't actively adding fresh, new content, then it won't help your website nearly as much. Of all the community forums serving our area, MyMountainTown.com is the only one that fits all of those criteria, plus we have the best social media reach and can boast intangibles of being a highly-regarded, multi-award winning by both our peers (double Conifer Chamber of Commerce Home-Based Business of the Year) and our community (twice-voted Best Local Website by the readers of The Flume and Best Home-Based Business by the readers of Your Mountain Connection). If your business isn't already listed in our Directory and you aren't posting in our Forums regularly, then come on and join us - we'd love to help increase the visibility of your business!